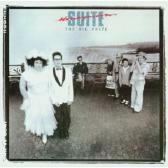 Honeymoon Suite was formed in Canada -- Niagara Falls, to be exact. They won a contest with the single “New Girl Now” and that prompted the band to use producer Bruce Fairbairn to usher them into rock stardom. Bruce helped Bon Jovi, Aerosmith and Loverboy break it big, too. “The Big Prize” was Honeymoon Suite’s break-through disc. I think their name is fitting since Niagara Falls is a famed honeymoon destination. Honeymoon Suite doesn’t have a tough sound but they do have a confident one. The guitar was always an important feature for a band from Canada but for some of those bands, it was a knee in the back when it came to musicianship. If you listen closely to the guitar on this CD you can hear some early White Lion (minus the over the top tapping). The band was formed by vocalist Johnny Dee and guitar player Derry Grehen, who possess a voice for back up that soars on “Feel It Again,” their only Top 40 hit. If you haven’t heard it in a while, it’s a classic to re-visit. Despite the success with “The Big Prize” these guys peaked and never did climb any higher, despite a string of follow-up recordings, culminating in "Dreamland," a 2005 Europe-only release. Honeymoon Suite: Johnny Dee – vocals; Derry Grehen – guitar; Ray Coburn – keyboards; Gary Lalonde – bass; Dave Betts – drums. For more information, check out http://www.honeymoonsuite.com.